Immersive 3D audio is undoubtedly one aspect of Next Generation Audio. It might be be a channel based mix in a dedicated 3D audio format, or just a surround audio bed with some separated 3D objects included. It could also involve complex Higher Order Ambisonics to deliver a 3D immersive audio impression. In contrast to that approach, personalized audio can be incorporated into traditional and standard channel based formats, in the same way as stereo or mono. Object based audio (OBA) will give the end user the option of personalising their experience by selecting from a number of audio sources and controlling the level and maybe even the position in the mix. In object based audio, an "object" is essentially an audio stream with accompanying descriptive metadata. The metadata carries information about where and how to render the object in a mix that is being reproduced. That might sound complicated, but in fact it is very straightforward. Two versions of a commentary with one mono FX stream is already an OBA format, and having the ability to choose between one commentary track or the other is already personalised audio. This system works fine as long as both commentary tracks reach the recipients home as separated audio channels and are not mixed into the audio bed. One of the major challenges for the production side of the industry will be to start OBA production strategies. This means completely rethinking how we perform the final mix because, with OBA, it will be performed at home by the viewer rather than by a mixer in a post-production facility. We have to bear in mind that as soon as post houses mix objects (different language commentaries, for example) into the audio bed, they are gone and are no longer available for personalized delivery to the viewer at home. Therefore, to give viewers the chance for personalized audio, you need to change your production workflow and deliver separate 'unmixed' channels so that the final mix can be finished in the home receiver and decoder. This is very different to how we currently mix for surround or for standard stereo audio, which is still the most common audio format. So, are you ready for the challenge? Do your audio production people understand this new way of working whereby they no longer have the final mix in their hands? Have you also considered how you prepare material so that object based audio tracks - and their accompanying metadata - survive during post production and arrive intact at the broadcast transmission facility? At Junger Audio we are already preparing for this challenge by developing quality Smart Audio tools for OBA procedures. 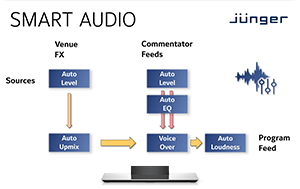 One of them is "Auto Program Feed Mixing" - a new procedure that will perform automated voice-over mixing for commentator tracks (objects) at the end of the chain. This is ideal for services that need to be distributed as composite channel based mixes (in stereo or surround). It also enables programme makers to start OBA production schemes even if they can't go all the way towards Next Generation Audio codec-based personalized delivery yet. And, of course, this Smart Audio procedure offers the chance for automation, maximum flexibility, higher efficiency and predictable performance - all of which are features that today's broadcasters need. Our technology will enable broadcasters to transition to Next Generation Audio formats with confidence, as well as delivering more efficient workflows. It will also ensure that end users benefit from an enhanced listening experience with predictable and reliable results.